New bundt cake pan + a friend’s birthday = an excuse to bake a cake. OK, who am I kidding, it takes very little to motivate me to bake. If someone sneezes, I can find a way to make that into an opportunity to bake. This recipe for Sour Cream Pound Cake with Heath Toffee Bits & Mini Chocolate Chips is a monster of a cake coming in at 12 cups of batter. 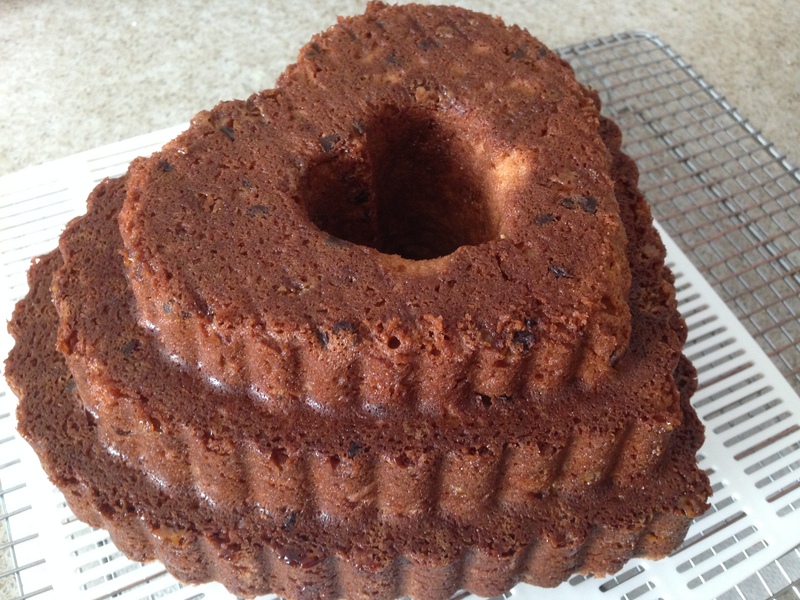 My charming heart-shaped bundt pan only holds 10 cups, but I took a chance with hoping it wouldn’t rise too much and overflow during baking. 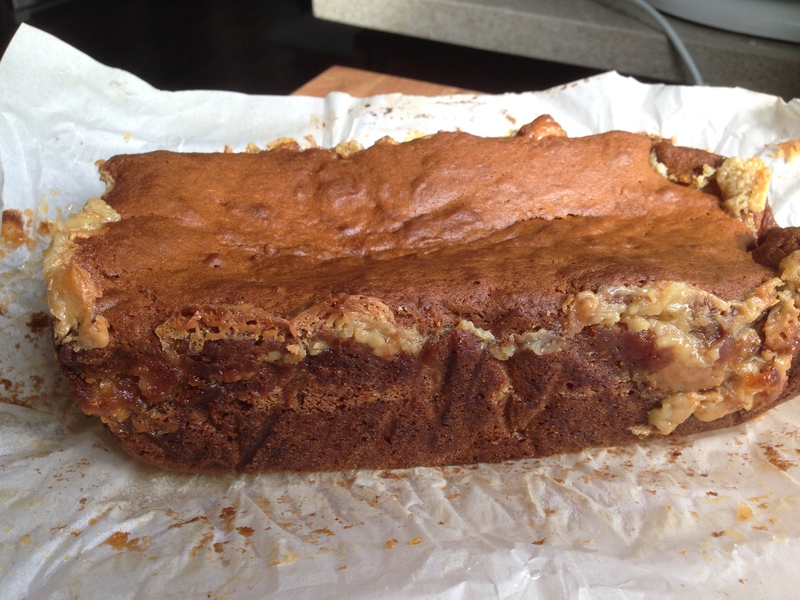 Luckily batter overflow disaster was averted this time, but next time I’ll bake this in a 12 cup tube pan. 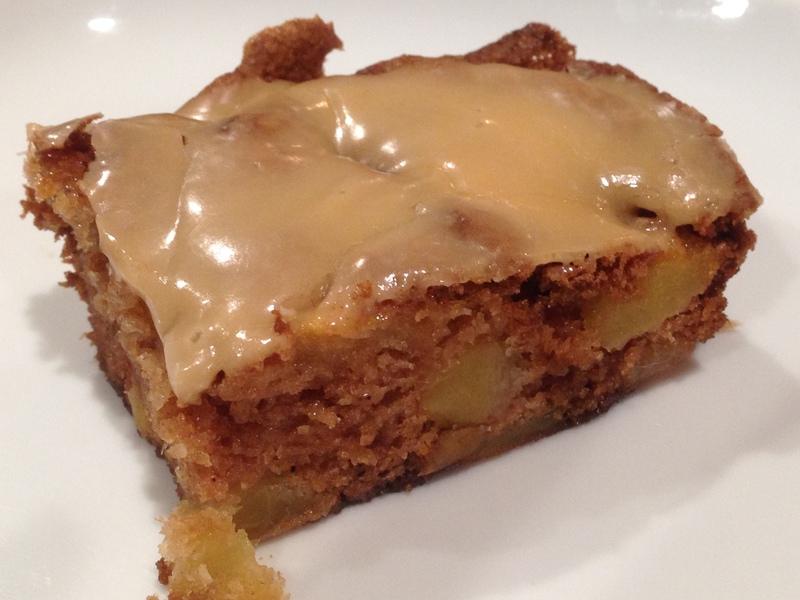 The cake is tender and buttery, with a distinctive almond flavor (due to the almond extract). You can experiment with your own add ins, but I used Heath toffee bits and mini chocolate chips because I needed to use them up (and they’re small enough so that they stay evenly distributed throughout the batter and wouldn’t sink to the bottom of the batter while baking). The cake rises quite a bit so make sure to leave some headroom at the top of your pan for rising during baking. 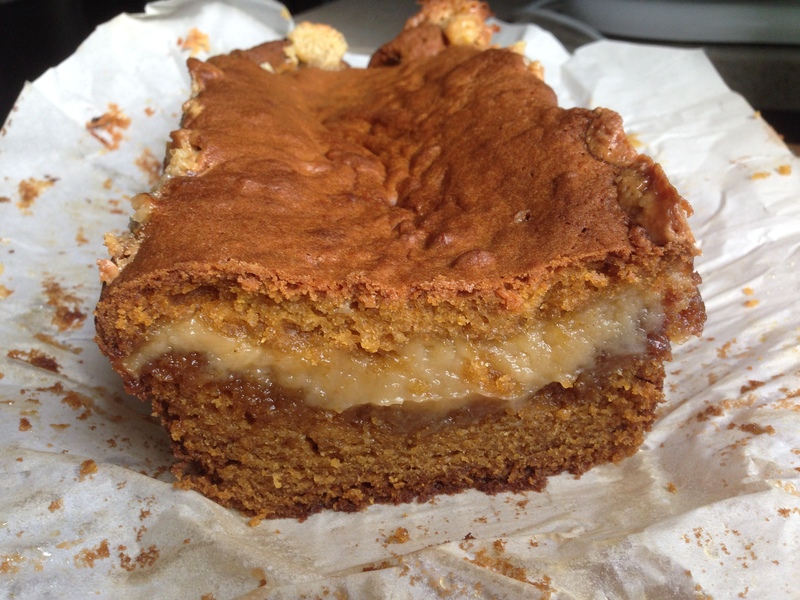 The cake is delicious on its own without a glaze or frosting. 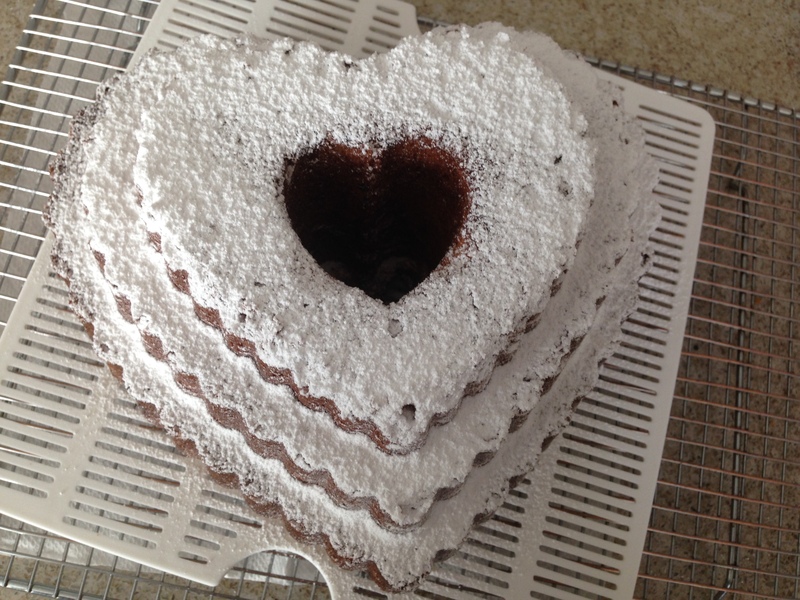 But it’s even prettier with a sprinkling of powdered sugar on top. 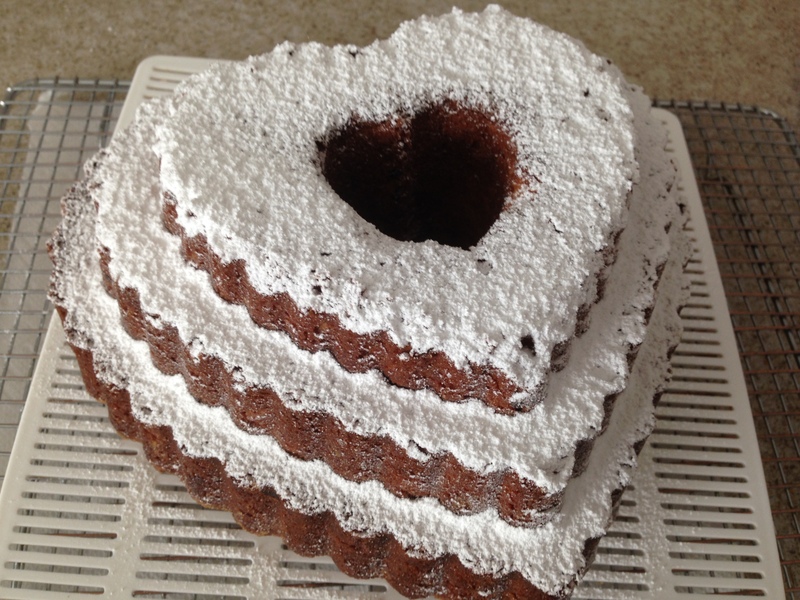 Here’s a link to the Heart Tiered Bundt Pan. Grease and flour a 10 to 12 cup bundt pan or tube pan. In a large bowl, cream together the butter and sugar until lightened in color and well mixed. In a separate large bowl, stir together the flour, baking soda, baking powder, salt, and cake enhancer (optional). Add about 1/4 of the flour mixture to the wet ingredients and mix. Alternate adding the sour cream and flour mixture while mixing, and finish with adding the flour mixture. Stir in the chocolate chips and Heath bits. Pour the batter into the bundt or tube pan. 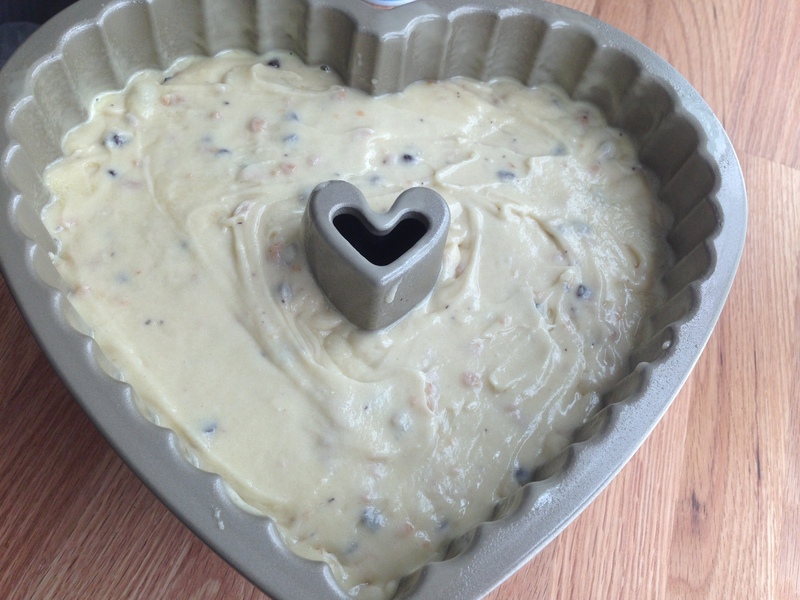 Make sure the batter does not fill the pan completely as the cake rises quite a bit while baking. Gently tap the filled pan against the counter to settle the batter and get rid of any air pockets. Smooth out the top of the batter with a spatula if needed. 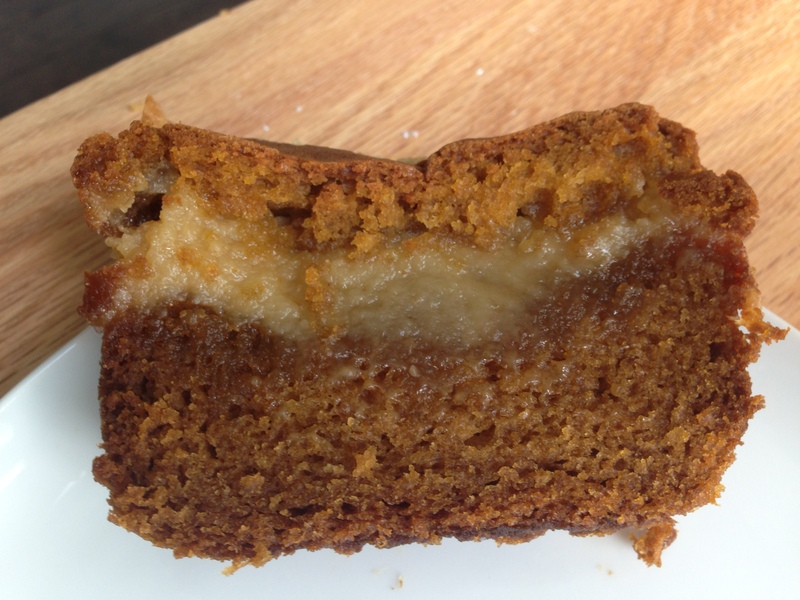 Bake for about 1 hour and 30 minutes or until a toothpick inserted into the cake comes out clean with just a few crumbs. Look at this chocolate. It’s as smooth as glass. And if you were sitting on your surfboard in the middle of this calm chocolate ocean, you won’t even be bummed that there wasn’t a wave in sight because you could dip your finger down past the dark chocolate into the sticky, cinnamon-infused dulce de leche sitting below, eventually stopping at the crispy, crumbly cinnamon-coconut shortbread crust. You can’t get more stoked than that. Line a 9×14 inch pan with parchment paper. In a large mixer bowl, combine the flour mixture, brown sugar, coconut, butter, and cinnamon. Mix well on low. 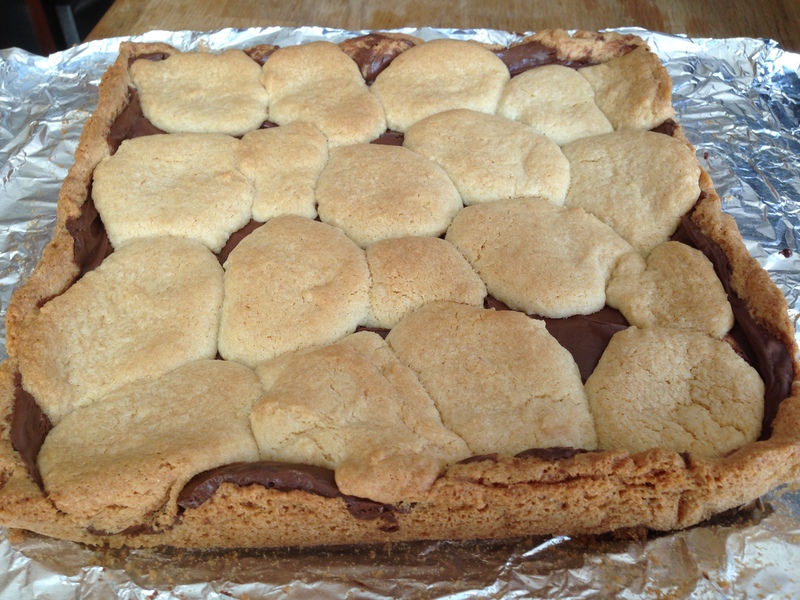 Press the dough into the baking pan so that it’s about 1/4-inch thick. Bake at 360° for 10 minutes. Remove the pan from the oven and let cool a bit. Combine the milk, golden syrup, and butter in a small heavy saucepan. Cook over medium heat, making sure to stir constantly. At one point, the mixture may start to get lumpy (like ricotta cheese), but just keep stirring and it will smooth out. 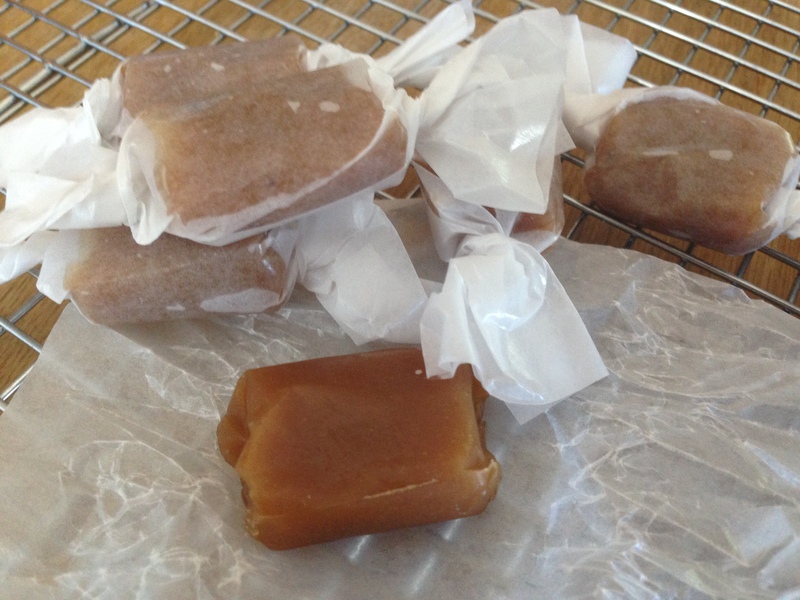 Cook until big bubbles form and the mix is thickened and a light caramel color, about 8-10 minutes. Take the dulce de leche off of the heat and stir in the vanilla. 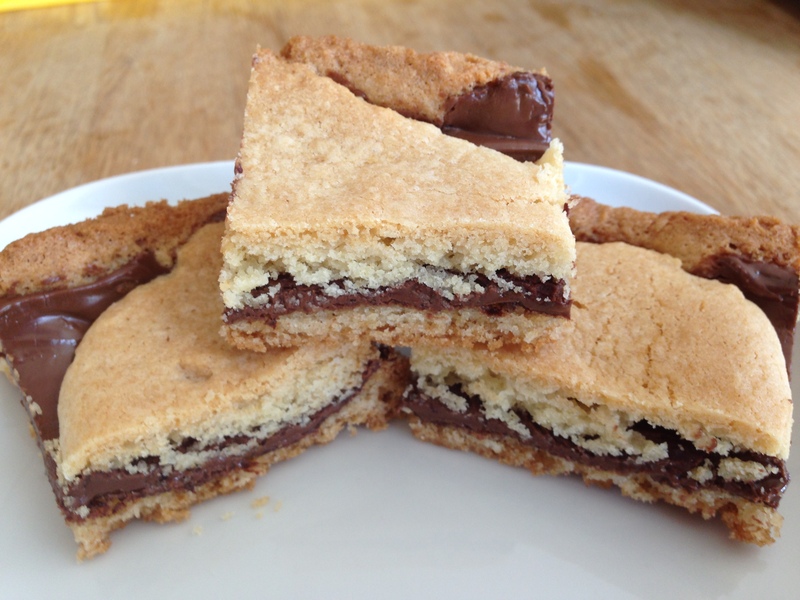 Pour the dulce de leche over the shortbread base and gently spread it. Return the pan to the oven for 10 minutes, then remove from the oven and let cool. Melt the chocolate and butter using a double boiler or in a glass bowl placed over a pot of boiling water. Stir until melted. Pour and spread the chocolate over the cooled caramel. Refrigerate until the chocolate has set, about 2 hours. Let the cold bars site at room temperature for about five minutes, and then cut into bars [if you cut the bars right out of the fridge when they’re too cold, the chocolate may crack or separate from the dulce de leche]. Cut and serve or refrigerate the cut pieces in an airtight container. People warned me that when I moved to “the Valley” from downtown LA, the weather would be much warmer, but I was not quite prepared for just how quickly my bananas would ripen in the heat. Until I better calibrate my banana eating to the speed of banana ripening, I’ll be baking up all sorts of banana related goods. 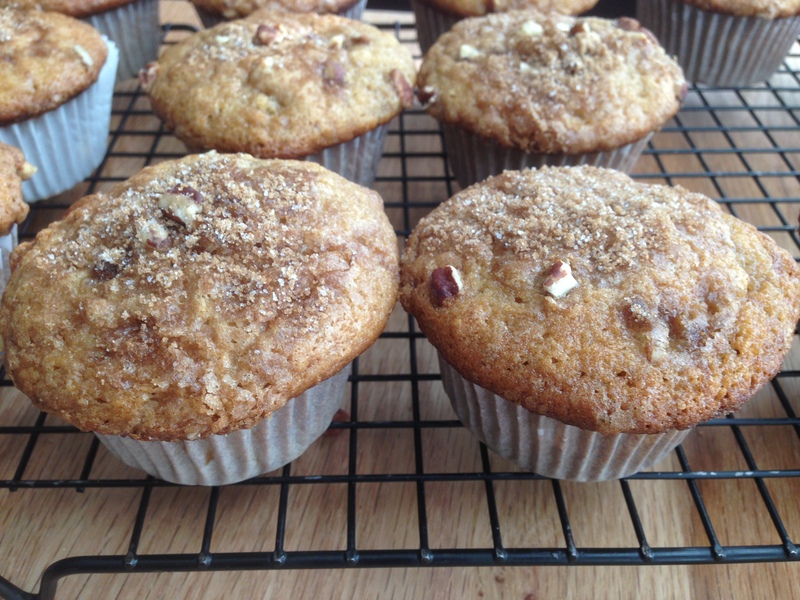 These Banana Pecan Buttermilk Muffins are super tender and have an airy snack cake-like texture while the brown sugar pecan topping provides a crunchy contrast. 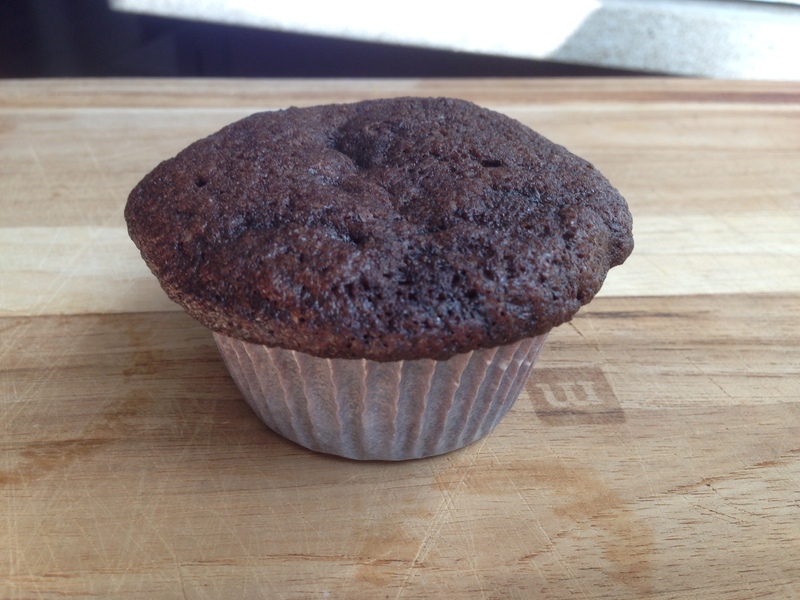 On the day that they’re baked, the muffins have a mild banana flavor which intensifies overnight. Line 2 muffin tins with paper liners. You’ll only need 16 paper liners. In a large bowl, stir together the flour, baking soda, cinnamon, and salt, and set the bowl aside. In a separate large bowl, cream together the sugar and butter. Add the eggs one at a time to the butter-sugar mixture, beating well after each addition. Beat in the banana and vanilla. Add the dry ingredients to the wet ingredients, starting off by mixing at low speed. Mix until just combined (don’t over mix). Spoon/scoop the batter into the muffin liners (or grease and flour the muffin tins if you’re not using liners). In a small bowl, stir together the topping ingredients (cinnamon, brown sugar, white sugar, and pecans) and sprinkle on the muffin tops before baking. Bake the muffins at 350° for 18-20 minutes.